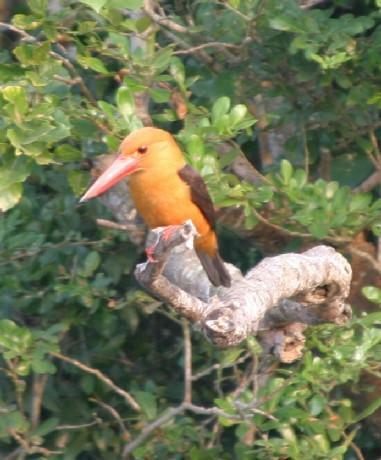 Bhitarkanika Wildlife Sanctuary is a salt tolerant complex and dynamic eco system where in you can find Mangroves that occur in the tropical and the sub tropical inter tidal regions. Bhitarkanika is of a rich and lush green as well as vibrant eco system which lies in the estuarine region of Brahmani and Baitarani in the north eastern parts Kendrapara District of the state of Orissa in India. You can find a network of creeks in the area which intersect Bay of Bengal and the alley which forms between the creeks and the rivers houses the largest mangrove eco system in India. The area of the mangrove forest and the wetland is about 672 square kilometers. The Park provides home to more than 215 species of birds including migrating birds or the winter from Central asia as well as Europe. 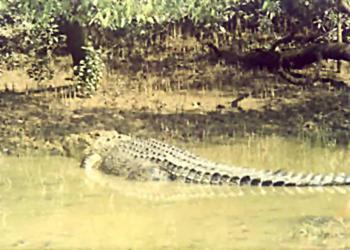 One can also see salt water crocodiles and other wildlife that inhabits in this type of Eco system. Bhitakanika National Park is an important habitat of leopards, fishing cat, sambar, hyena, wild boar, spotted deer, jungle cat, porcupine, salt water crocodile including partially white crocodile and reptiles like python, king cobra, water monitor lizards, dolphin, terrapin, marine turtle, as well as birds, namely kingfisher, white bellied sea eagle, hornbill, bar headed geese, wood pecker, pintail, brahmany duck, tern, sea gull, waders and a large variety of other resident and migratory birds. 2 Nos Forest Rest Houses. 2 Nos Four Bed Cottages. 1 Ten Bed Log House. 03 Nos Double Bed Room. Sand Pebbles Tour n Travels. The National Park remains closed during the 2nd week of January every year for census of crocodile and from 15th May to 31st July for crocodile nesting and breeding. 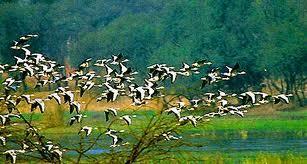 Khola ad Gupti are the two entry points to enter the Bhitarkanika National Park. You will have to take an entry permit from the Forest office Check Gate at Khola and Gupti. You can find boats belonging to the Forest Department as well as other private parties at both Khola and Gupti. Private boats are available at Jayanagar and Chandabali also. Bhubaneswar is the nearest airport which is located at about 160 kilometers away from Khola and Gupti. The nearest Railway Stations to the Sanctuary are Bhadrak, Cuttack and Bhubaneswa. Bhadrak is placed at 55 kilometers from Chandabali and 70 kilometers fro Jayanagar. Cuttack is placed at about 140 kilometers from Khola and Gupti while Bhubaneswar is at about 160 kilometers away. Exploration of nature in Kaziranga National Park has been made easy by the provision of elephant and Jeep Safari of Tour My India (kaziranga-national –park.com). Elephant and Jeep safari will cover different ranges of the park in 3 days. Below are the details of itinerary of this exiting tour to Kaziranga National Park.